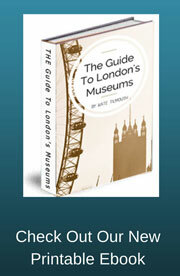 The European galleries at the British museum are situated on the upper floor rooms 40 - 51. They cover from 10,000 BC to the present day, including the Romans in Britain and Medieval Europe. Some of the galleries have been recently refurbished and there are still some works ongoing although they should be finished by 2012 and the collections in these rooms can still be viewed in temporary exhibition space. I have chosen four items from this collection to highlight what can be seen in this part of the British Museum. Also they are items which I always make sure i see when i visit the museum, some of them have special memories for me and others are just simply stunning. So if you can see them during your visit I'm sure you won't be disappointed. I know this piece very well as it was the subject of a school exhibition I played a big part in. I even went as far as creating a replica of the helmet using paper Mache. This helmet is a very rare item as it is of only four which has been found which dates back to the early medieval period. The helmet was very badly damaged when it was first found as it had been crushed in the burial chamber it was found in. It took much painstaking work to put all the pieces together and restore it to its original state. A replica of the helmet was also made to show how the helmet would have looked when it was first made and this can also be seen in the same exhibition. One of the most fascinating aspects of this helmet is the face plate which has eye sockets, eyebrows and a nose. The eyebrows are inlaid with silver wire and garnets and at the end of each ends with a bronze boars head. The helmet was found in a royal burial of a Anglo Saxon king who was buried in a ship along with a great amount of treasure to sustain him in the afterlife. One of the most striking items in the museum is the remains of the Lindow man. Again this exhibit is tucked away in the corner of one of the galleries (room 50) and you could easily miss it, i know i did and i had to go back and find it. Do make the effort to go find him as he rally is a special exhibit. 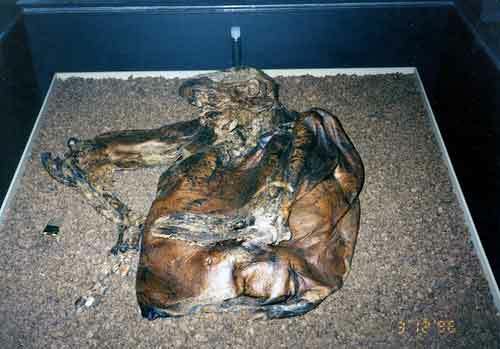 The Lindow man was found in 1984 in a peat bog in Cheshire, England, the remains date back to the first century BC. What you will see is the very well preserved remains of a young man. His skin of course has discoloured from the peat bog and turned into thick leather but you can still make out his features. He still has hair on his head and many of his internal organs were also preserved but these cannot be seen. From the marks on his body it is believed that he was brutally killed, possibly as part of a ritual killing by the druids. The cup can be found in room 40 in the European Galleries. 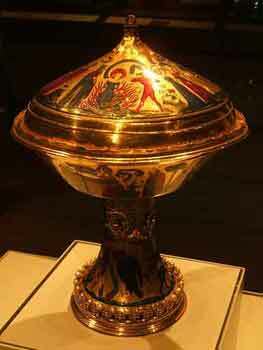 This cup was given to Charles VI of France on the occasion of his visit to Tourraine in 1391. The decoration on the top of the cup depicts the life and miracles of St Agnes. Later the cup became the property of John, Duke of Bedford and was then later mentioned in various royal accounts of the Tudors. During this time two extra bands of enamel were inserted which shows Tudor roses and an inscription about the end of the war in 1604 between James I of England and Philip III of Spain. This item can be found in room 45 within the European Galleries. A reliquary is a special receptacle for relics and this one was made in Paris before 1397AD to contain a thorn which is said to have been a part of the crown or thorns placed on the head of Jesus Christ at his crucifixion. The thorn can be seen behind a crystal window. This is a stunning piece and contains pearls, rubies and sapphires some of which are used to support the thorn. The scene which surrounds the relic is of the Last Judgement and the figures of the Virgin Mary, St John the Baptist and Christ can be seen. The figures of the twelve Apostles with God decorate the sides of the reliquary with angels around the bottom. It really is an amazing piece and I recommend that you take your time exploring this item in detail. The above items are just a few items from the European galleries, many more wonderful items can be seen and I hope you enjoy them as much as I do.